The public makes clear distinctions in assessing the extent to which some groups in the society face discrimination today. 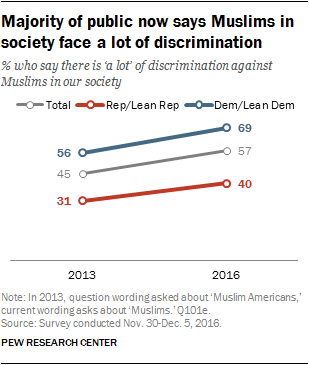 A large majority of Americans (82%) say Muslims in the United States face discrimination – with 57% saying they face “a lot” of discrimination. But majorities also say that gays and lesbians (76%), blacks (76%), Hispanics (70%) and women (60%) face at least some discrimination. Fewer Americans say Jews (44%), evangelical Christians (42%) or whites (38%) face a lot or some discrimination. Democrats are much more likely than Republicans to say blacks, Muslims, Hispanics, gays and lesbians and women face discrimination in society today. 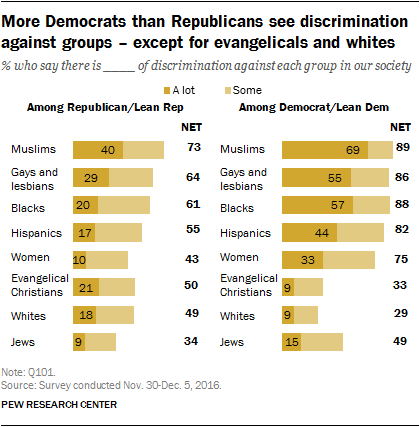 By contrast, Republicans are somewhat more likely than Democrats to see discrimination against evangelical Christians and whites. Overwhelming shares of Democrats and Democratic leaners say Muslims (89%), blacks (88%), gays and lesbians (86%) and Hispanics (82%) face a lot or some discrimination in society today. And most Democrats say there is a lot of discrimination (as opposed to just some) against Muslims (69%), blacks (57%) and gays and lesbians (55%). Smaller majorities of Republicans and Republican leaners say there is at least some discrimination against Muslims (73%), blacks (61%), gays and lesbians (64%), and Hispanics (55%). Unlike Democrats, however, fewer than half of Republicans say Muslims face a lot of discrimination (40%), while just 29% say this about gays and lesbians and only 20% say blacks face a lot of discrimination. Three-quarters of Democrats say there is at least some discrimination against women in society today, including 33% who see a lot of discrimination. Just 43% of Republicans say women face a lot or some discrimination, with just 10% saying a lot. Democrats also are more likely than Republicans to say Jews in this country face at least some discrimination (49% vs. 34%). Half of Republicans say there is a lot or some discrimination against evangelical Christians; 21% see a lot of discrimination against evangelicals. Just 33% of Democrats say evangelicals are discriminated against, with 9% saying they face a lot of discrimination. Republicans also are far more likely than Democrats to say whites in the U.S. face discrimination: 49% of Republicans say there is at least some discrimination against whites, compared with 29% of Democrats. Over the last three years, the public has become more likely to say blacks and Muslims face a lot of discrimination in society. In 2013, when asked a similarly worded question using the term “African Americans” rather than blacks, 22% said African Americans faced a lot of discrimination. In the current survey, 41% say blacks face a lot of discrimination today. 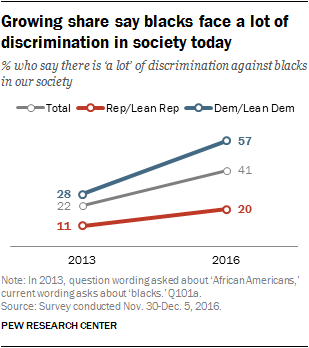 Views have shifted dramatically among Democrats and Democratic leaners: 28% said African Americans faced a lot of discrimination in 2013, compared with 57% who say this about blacks today. There has been less change in views on this question among Republicans and Republican leaners (from 11% in 2013, to 20% in 2016). The public also sees more discrimination against Muslims today than in 2013. Overall, 57% say Muslims face a lot of discrimination today, up from 45% in 2013 (the 2013 survey used slightly different wording and asked about “Muslim Americans”). Over the past three years, Democrats have become 13 points more likely say there is a lot of discrimination against Muslims, while Republicans have become 9 points more likely to say this. The shares of the public seeing a lot of discrimination against women (23% now, 15% then) and Hispanics (32% now, 25% then) have also edged higher since 2013. The public views conflicts in the U.S. between Republicans and Democrats as much more intense than those between other groups, including rich people and poor people, blacks and whites, and immigrants and those born in in the U.S. Fully 85% say there are very strong (56%) or strong (29%) conflicts between Republicans and Democrats in the U.S. Just 12% say there are not very strong conflicts (9%) or no conflicts (3%) between partisans. Republicans and Democrats are the only groups included in the survey for which a majority of Americans say there are very strong conflicts. 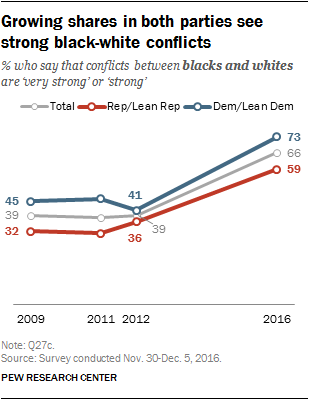 Most also see at least strong conflicts in the country between blacks and whites (66%), though just 26% describe these conflicts as very strong. There is a similar pattern in views of the amount of conflict between rich people and poor people and between immigrants and those born in the U.S. Overall, 63% say there are at least strong conflicts between rich people and poor people, though just 30% describe them as very strong. When it comes to conflicts between immigrants and people born in the U.S., 59% say there are either very strong (24%) or strong (35%) conflicts between these two groups. Amid discussion regarding the new administration and possible changes to Medicare and Social Security, relatively few see conflicts between young people and older people: 40% see at least strong conflicts, including just 13% who see very strong conflicts. And while a wide gap emerged between those with and without a college degree in 2016 presidential voting preferences, the public does not see widespread conflicts between the two groups: 37% see very strong (10%) or strong (26%) conflicts between those with a college degree and those who did not go to college. Similarly, fewer than half (40%) say there are very strong (13%) or strong (27%) conflicts between people who live in cities and people who live in rural areas. Republicans and Democrats are equally likely to see strong conflicts between their respective partisan groups, but they differ in other assessments, with Democrats more likely than Republicans to see conflict across a range of groups. Large majorities of Republicans and Republican leaners (88%) and Democrats and Democratic leaners (87%) say there are very strong or strong conflicts between Republicans and Democrats in the country today. 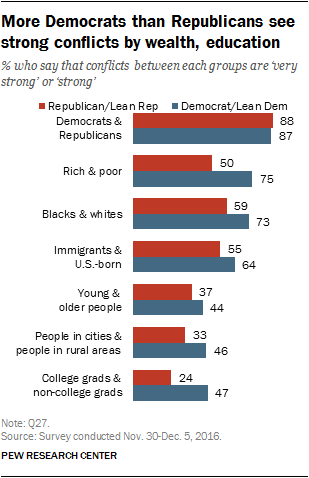 When it comes to differences between rich people and poor people in the country, fully 75% of Democrats and Democratic leaners say there are very strong or strong conflicts between these two groups, compared with fewer Republicans and Republican leaners (50%) who say the same. Most Democrats also say there are very strong or strong conflicts between blacks and whites (73%) and immigrants and those born in the U.S. (64%). Somewhat smaller majorities of Republicans see at least strong conflicts between these two sets of groups (59% and 55%, respectively). Overall, 47% of Democrats say there are very strong or strong conflicts between people with a college degree and those who did not go to college; just 24% of Republicans agree. Democrats also are more likely than Republicans to see at least strong conflicts between people who live in cities and people who live in rural areas and younger people and older people, though fewer than half of both Republicans and Democrats say there are very strong or strong conflicts between these two sets of groups. There has been a sharp rise over the past four years in the share saying there are deep conflicts between blacks and whites. In December 2012, 39% of the public said there were very strong (11%) or strong (28%) conflicts between blacks and whites in the U.S. Since that time – a period that saw several high-profile police shootings of African Americans, the emergence of the Black Lives Matter movement and the 2016 presidential election campaign – the share who say there are very strong or strong conflicts between the two groups has risen to 66%. Democrats and Democratic leaners (73%) are somewhat more likely than Republicans and Republican leaners (59%) to say there are at least strong conflicts between blacks and whites. Both Republicans and Democrats are significantly more likely to say this today than in 2012. The share who see very strong or strong conflicts between young people and older people has increased from 29% in 2012 to 40% in the current survey. The share of Democrats who see at least strong conflicts between age groups is up 14 points from 2012 (to 44%), while the share of Republicans who say this is up 11 points over the last four years (to 37%).